Tcha, 4 ingredients! I love recipes that I don’t have to go to the store to make. If I wake up and realise I want to bake and can just jump straight into it, I’m happy. This is a traditional Italian recipe, those Italians are always winners for great flavour through simplicity. Torta di Noci is a very very simple recipe that just has 4 ingredients that you probably have at home now. This little gem of a recipe is also gluten and dairy free, which is always handy if you are baking for guests, or even if you just want a healthier option…although I have used conventional sugar here you could probably substitute if for coconut sugar etc if you want to be super good. Blitz the walnuts in a food processor until the are similar to ground almonds, or coarse sand. Beat the egg yolks with the sugar until pale and creamy. Add the lemon zest and walnuts and stir to combine. Meanwhile start whisking the egg whites in a seperate bowl until you get stiff peaks. Fold the egg whites into the walnut mixture carefully, you don’t want to knock out all of the air. Pour the mixture into the prepared baking tin and bake for about 50mins. The top should be firm to touch and nicely browned. Leave the cake in the tin to cool completely before removing it, otherwise it could break when taking it out. This cake is one that gets better with a little time, so if making it for a dinner party etc, make it the day before. I sprinkled mine with a little icing sugar, as I don’t think it needs anything more and I like to leave in it’s simplicity. Enjoy with some strong coffee. This looks amazing! I have never seen a walnut cake like this but definitely want to try it – I was given a huge bag of fresh walnuts recently off a friends tree so have been looking for different ways to use them. So good that it is a healthy option too – often walnut cakes are just a butter cake with a bit of flour replaced with ground walnuts, so I love that this is actually almost all walnuts. Wow your friend has a walnut tree, that sounds great. I’ve never had fresh walnuts like that. Yeah I always kind of struggle to find recipes for walnut, usually coffee cake etc but this cake really takes walnut to the next level. What a fantastic cake! 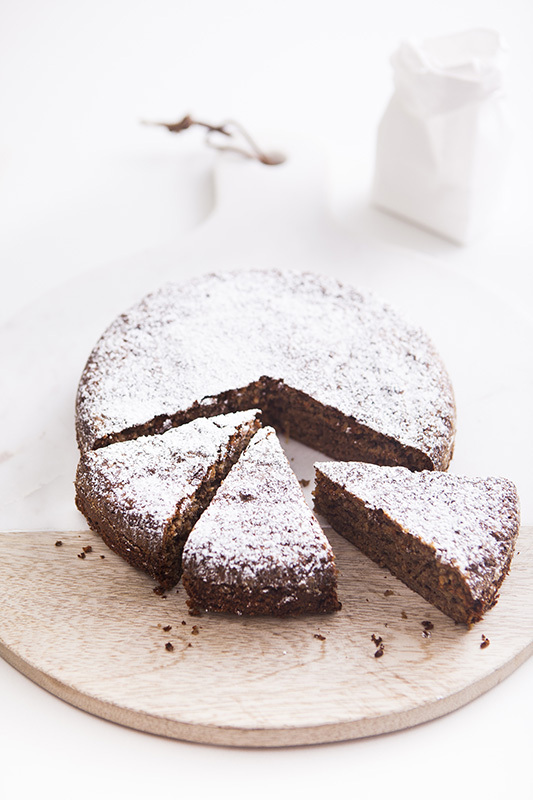 I love nut based cakes as they are always so moist, light and delicious. This walnut one looks especially good too.. love how its gluten free. Thanks Thalia, yeah it’s one of those cakes that doesn’t feel heavy and intense either…it’s quite light and fresh! Yes the second time I have made this .Will use it as an Easter cake and perhaps put a few mini eggs on top. Horrid damp grey day so best thing to do is cook for visitors arriving on Sunday.Off to prepare the rest of our cooking apples .Keep very well in a old broken freezer in apple store .They last so well and rodents can’t get at them!.